The Novice section provides for instrumental music only where the participant has received less than 18 teaching. This applies to all novices, irrespective of the TEACHING method (traditional classical or modern contemporary. This section provides for both junior and senior students of instrumental music only, both classical and contemporary where classical and contemporary refers to the TEACHING method. All students who have been studying for less than 18 months should enter in this category. However, the 18 months refer to a student’s total experience and involvement in music. A New student on flute that did 2 years on a recorder is not considered as a Novice. Students that, having passed the novice stage of 18 months, are still performing pieces on an elementary level can enter in this category. These pieces usually come from tutor books, are fairly easy and often are simplified arrangements of well-known folk tunes, classical pieces, and even contemporary pieces, etc. Very often it doesn’t fit into the Classical categories as described in the section for Classical music. All primary / secondary school students who have been studying an instrument for less than 18 months should enter in this category. Kindly note that the 18 months refer to a student’s total experience and involvement in music. As pieces for primary school novices are normally very short it may be repeated twice, or alternatively participants may present 2 very short pieces as one item. Kindly note that the 18 months refer to a student’s total experience and involvement in music. Students who have been study­ing an instrument (piano, digital keyboard, recorder, violin, etc.) for less than 18 months may enter in this category. (Kindly note: the 18 months refer to a student’s total experience and involvement in music). Participants should present a programme of 3 pieces. No piece that has been entered separately may be performed in this section. Participants must provide their own instruments (where applicable) and should provide the adjudicator with a copy of their music prior to their performance. Music tutor books often include small and simple concert pieces where the teacher’s part provides some flair to the music. This category is particularly useful for learners who are very shy and reliant on the teacher and allows the opportunity to build their confidence. The presence of the teacher helps to create an environment where the participant can feel safe and secure. These pieces are normally very short and may thus be repeated. Alternatively participants may present 2 very short pieces as one item. Only students who have been study­ing for less than 18 months may enter in this category. Students who have been study­ing digital keyboard for less than 18 months may enter in this category. (Kindly note: the 18 months refer to a student’s total experience and involvement in music). This item allows these students to perform in ensemble with other digital keyboard players. These pieces are normally very short and may thus be repeated. Alternatively participants may present 2 very short pieces as one item. Part playing is not required and students may play in unison. Participants must provide their own instruments and should provide the adjudicator with a copy of their music prior to their performance. This category provides for primary and secondary school students that, having passed the novice stage, are still performing pieces on an elementary level. These pieces usually come from tutor books, are fairly easy and often are simplified arrangements of well-known folk tunes, classical pieces, and even contemporary pieces, etc. 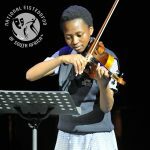 This category provides for primary / secondary school students that, having passed the novice stage, are still performing pieces on an elementary level. These pieces usually come from tutor books, are fairly easy and often are simplified arrangements of well-known folk tunes, classical pieces, and even contemporary pieces, etc. Music tutor books often concert pieces where the teacher’s part provides some flair to the music. This category is particularly useful for secondary school learners who are very shy and reliant on the teacher and allows the opportunity to build their confidence. The presence of the teacher helps to create an environment where the participant can feel safe and secure.